Fiction – Kindle edition; Vintage; 274 pages; 2016. 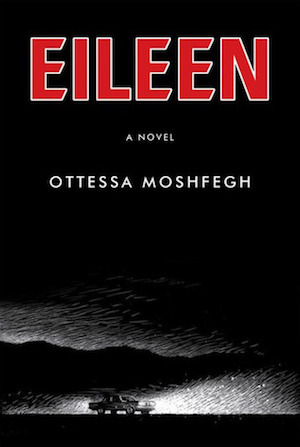 Ottessa Moshfegh’s Eileen was shortlisted for the 2016 Man Booker Prize. A literary/crime crossover novel, it was also shortlisted for the 2016 Gordon Burn Prize and the 2016 CWA New Blood Dagger. So here we are. My name was Eileen Dunlop. Now you know me. I was twenty-four years old and had a job that paid fifty-seven dollars a week as a kind of secretary at a private juvenile correctional facility for teenage boys. I think of it now as what it really was for all intents and purposes—a prison for children. I will call it Moorehead. Delvin Moorehead was a terrible landlord I had years later, and so to use his name for such a place feels appropriate. In a week, I would run away from home and never go back. This is the story of how I disappeared. In punchy, often daring, prose, Eileen tells us about the bleak nature of her existence — “I hated almost everything. I was very unhappy and angry all the time” — claiming that she feels “invisible”, as if she has been “born into the wrong life”. She doesn’t bother washing, has questionable toilet habits and a weird relationship with food. Her relationship with her father, an ex-policeman who is an alcoholic, is a strange, tortured and co-dependent one. He had no loyalty to me. He was never proud of me. He never praised me. He simply didn’t like me. His loyalty was to the gin. And so Eileen, the perfect outsider with no family or friends to support her, develops unhealthy attractions to her co-workers. First, there is Randy, a prison guard, with big “hound-dog eyes […] and hair that gleamed in a high ducktail” whom she admires from afar, and then there is Rebecca, the new prison counsellor, with whom she strikes up a friendship. I thought of Rebecca, whose arrival at Moorehead seemed like a sweet promise from God that my situation could improve. I was no longer alone. Finally, here was a friend I could admire and open up to, who could understand me, my plight, and help me rise above it. She was my ticket to a new life. And she was so clever and beautiful, I thought, the embodiment of all my fantasies for myself. I knew I couldn’t be her, but I could be with her, and that was enough to thrill me. This friendship leads Eileen into dark and dangerous territory, and by the tale’s end a crime has been committed and things will never be the same again. I read Eileen for my book group and couldn’t quite make up my mind about it: bits of it I loathed, while other bits intrigued me. It’s fast-paced and spends a lot of time building up tension, but this is not a conventional crime novel and there’s not much of a plot. Overall I came away from it feeling disappointed: it seems to take a long time to get anywhere and when you arrive you realise the destination is lack lustre. The mood and tone of this novel is a triumph, though. A dark fug seemingly wafts from the page, and it’s hard not to turn your nose up in disgust or horror at some of the scenes depicted here. The story is often shocking and vile, but it’s witty too in a matter-of-fact kind of way. Eileen herself isn’t someone you want to spend an awful lot of time with, yet her voice, so full of resentment and self-loathing, is impossible to ignore: you get dragged into the sorry depths of her horrid life and wonder how she ever escaped the entrapment of poverty, squalor, hopelessness and hatred. As a character study, I suspect you would be hard pressed to find anything more searing, alive and lucent than Eileen. For other more positive reviews of this novel, please see Naomi’s at The Writes of Woman, and Kate’s at Booksaremyfavouriteandbest. I read Ottessa Mosfegh’s story collection, ‘Homesick for Another World’ earlier this year and felt similarly about it – you have to admire the rawness and that matter-of-fact tone with which she details the ugliness of her character’s lives, but I can’t say I enjoyed the book, and beyond the tone I’d struggle to remember the details of any of the stories. I’d probably read something else by her in the future as I think she has a unique voice, but I can’t say I’m in any hurry. I’d be interested in reading the short stories to compare them with this novel, but from what you say the tone and style are probably pretty similar. I read an interview with her in The Guardian where she claimed she wrote the entire book as an experiment and wanted to turn a mainstream established genre on its head. I read this last year for my Booker shortlist project. It was one of my least favourites from all six, but it retrospect I think it’s because there are very few redeeming features in Eileen: she is not likeable. I could not understand, and still don’t, how so many people loved it. Maybe it would have benefited from reading it for long periods at a time. She’s not likeable but she’s authentically drawn, I think, and for that reason the book works as a whole because the reader can identify with her (we’ve all been outsiders at some point and struggled with the dreary day-to-day), but I agree: I don’t understand why this book has been so universally praised. Agree completely with your review – there was enough there to keep me reading, just. This was a book group choice for me so I had to read it… I was keen to find out what the crime was but not sure it was worth reading 7/8th of the book to find out! Grim, cheerless reading has to have some redeeming features, otherwise, what’s the point? Maybe this book answers a question I sometimes ask myself when I see ‘losers’ on the TV news: how did he/she ever get to become like that? That’s a good point. I read an interview where the author said she based the character of Eileen on a news story she’d read where a young man had committed a horrendous crime and she’d wondered how he’d ever got to that point. That doesn’t make them any less valid though: at least these kinds of lives are being represented rather than not being mentioned at all. I’d hate to think as a journalist I couldn’t write a story about something because I didn’t have first hand experience of it. True. But it would be good if we could find a way to enable lost souls to tell their own stories. It’s a bit like Indigenous storytelling in Australia. For a long time, it was us telling stories about them. Now they’re telling their own stories, and it’s better. I reviewed this book and share many of your thoughts. I had about the same reaction to this book as you did. It’s a very melancholy book, with occasional disgusting moments in it — definitely need to be in the right frame of mind to read it, I think. I liked the writing and found the choice of character quite daring. She’s not only unlikabe but disgusting at times. What surprises me though, is that it’s completely gone from my memory now. It made a strong impression but that didn’t last. Yes, Eileen is definitely a daring (and controversial) character. She does some pretty vile things and views her own body in a kind of self-loathing matter-of-fact way and yet for all her bravura and eye-opening commentary and behaviour, I agree with you: the story isn’t particularly memorable. I read this 6 weeks ago and was only able write this review thanks to the notes I took while reading it. The book hadn’t really left a lasting impression.